In the bottom of the eighth inning, Andrelton Simmons hit a fly ball to left field that dropped in between Cardinals shortstop Pete Kozma and left fielder Holliday. Left field umpire Sam Holbrook called Simmons out, citing the infield fly rule. [lower-alpha 1] Had an infield fly not been called, Simmons would have been credited with a single and Atlanta would have had the bases loaded with one out, trailing 6–3. Fans littered the field with trash, delaying the game for 19 minutes before a message over the Turner Field public address system advised fans the game was subject to forfeiture by the umpires if the field continued to remain unplayable due to the thrown debris. Atlanta manager Fredi González announced that the Braves would play the rest of the game under protest. The protest was denied shortly after the game by Joe Torre, MLB executive vice president for baseball operations, saying it was a judgment call—which cannot be protested under MLB rules—and confirming the call's correctness. The questionable judgment call followed other questionable umpiring that went against the Atlanta Braves in the playoffs, including the Kent Hrbek–Ron Gant incident in the 1991 World Series and the Eric Gregg strike zone in the 1997 NLCS. In the bottom of the ninth inning, batting against Cardinals closer Jason Motte, Jones reached first base on an infield ground ball. Freddie Freeman hit a ground rule double, bringing Dan Uggla to bat as the potential tying run. Motte retired Uggla with a groundout to record the save, then both teams rushed off the field after fans resumed throwing debris. ↑ The infield fly rule states, in part, that the batter is out when, with first and second base occupied with less than two out, the batter hits a fair fly ball which is not a line drive nor bunt, and this fly ball can be caught by an infielder with ordinary effort. ↑ Bowman, Mark (October 1, 2012). "Braves fall to Pirates, will be Wild Card team". MLB.com. 1 2 3 "Cardinals overcome ugly delay, Braves – Chicago Tribune". Chicago Tribune. October 5, 2012. Retrieved October 7, 2012. ↑ "Cardinals-Braves Preview". Yahoo! Sports. October 4, 2012. Retrieved October 7, 2012. ↑ "STL-ATL Infield Fly (NL Wild Card): Why Call was Correct". Close Call Sports. October 6, 2012. ↑ "MLB Official Rules: 2.00 Definitions". October 5, 2012. ↑ Snyder, Matt (June 11, 2008). "Infield fly rule call mars Cardinals-Braves wild-card game". CBS Sports. Retrieved October 7, 2012. ↑ "Fan Protest/Throwing Trash on the Field". YouTube.com. 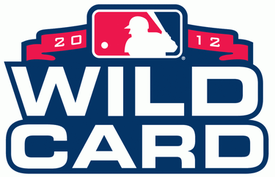 ↑ "Call of the Wild: Cards earn berth in NLDS: St. Louis takes advantage of three Atlanta errors, infield fly ruling". MLB.com. October 5, 2012. ↑ "Wild-card game stopped after call". Associated Press/ESPN. October 5, 2012. ↑ Goold, Derrick (October 5, 2012). "Cards survive wild Wild Card playoff". St. Louis Post-Dispatch. Retrieved October 7, 2012.